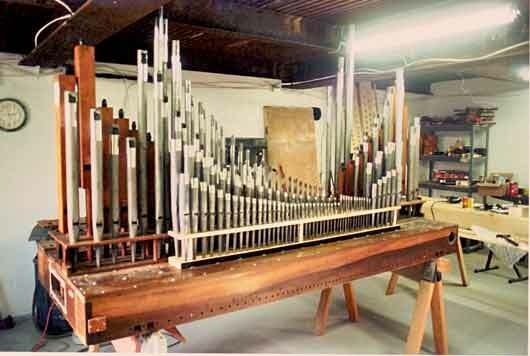 Pipe organs can be rebuilt and/or restored to their original state, or modernized to any extent. Any organ in the “instruments” section of this web site with an “R-“ in the opus number is a rebuilt organ. Of course, these organs are largely new, standing on all new mechanism. However, most of the pipes from the previous organ were used again. A perfect example is this picture, showing the organ for the University of Charleston in the shop as it was being fitted with new pipes in the shop. The original organ was a much moved 1915 Bennett with a typically limited early 20th century tonal scheme; the organ now has the best of new and old. We can work on just about any organ there is; the only caveat here is that we don’t generally go more than about two hours away from the Charleston area. However, contact us anyway- if we can’t do it we’ll recommend someone who can. A lot of organs out there suffer from indifferent tonal design and finishing. Many instruments people are disappointed with can “come to life” with revoicing and/or additions. Our best example of this was the work we performed at St. Mark’s United Methodist Church in downtown Charleston, where the 1957 Moller organ had an impressive stoplist, but very disappointing tonal output. We releathered, cleaned, and revoiced the organ in 2000 to help it get out of its disadvantageous chambers. The result was that some people thought that the organ had been replaced altogether! As mentioned above, we can releather virtually any standard organ actions. There are times when an organ is almost perfect as it is, it’s just in the wrong place! That was the case for this lovely 1904 Estey organ, which was originally located on the stage of Carnegie Hall in Lewisburg, West Virginia. 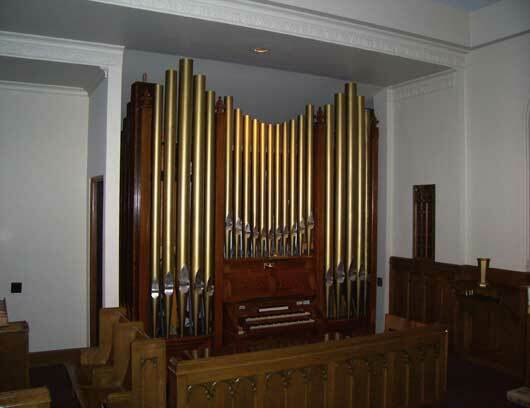 We removed the organ from the hall, releathered the manual primary actions and wind regulator, and reinstalled it in the chapel of Christ Church United Methodist in Charleston. We’re proud of the fact that we’ve kept the original tubular pneumatic action intact, making this the only organ of its kind in the state (that we know of). Maybe a new building is being built; perhaps the congregation is considering remodeling the sanctuary; whatever the case, an ounce of prevention is worth a pound of cure. With the advances in technology which have taken place over the last thirty years or so, it is possible to greatly expand the electronic systems of an organ at a reasonable cost. 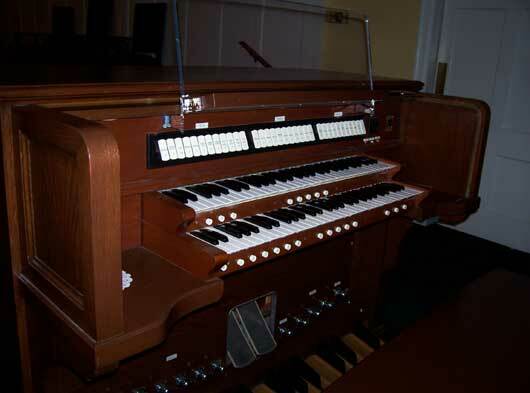 Shown above is a classic example: the original 1965 Wicks organ had a console with only five general pistons-and even those weren’t working reliably. We had a better, but still older console on hand which we rebuilt with a totally up to date combination action and coupler system. The console was refinished, new stop controls installed, and it was installed in place of the Wicks console. The result is a console which looks and works like new, but at a lower cost.